Your guests will love receiving this timeless keepsake as a beautiful reminder of your child's special day. 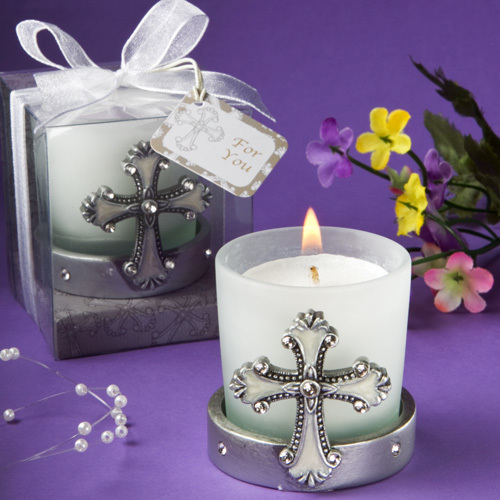 Our cross candle favors measure 2" round x 2" tall and feature a rhinestone enhanced, pewter finish poly-resin base with a pewter-finish-accented inlaid enamel ivory cross rising up with multiple rhinestone accents. A frosted white glass votive holder sits in the base with a poured white candle inside. Popular as Communion and Christening candle favors, each favor comes beautifully packaged in a clear box with a silver cross-design base and is tied with a white organza ribbon and has an attached matching design “For You” tag. Please allow us 5 business days to fulfill your order; then add ship time.